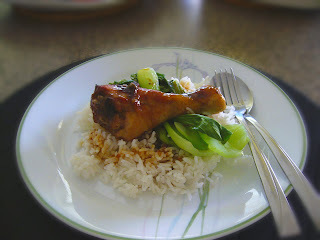 Quick Meal... easy to do...20 pieces drumsticks. I used 20 as it fit nicely on my roasting tray... don't have to waste electricity to just bake 8 pieces. can't finish?... freeze it up... and pack for kids lunchbox some other day!! Score the drumsticks. Marinate the drumsticks with Kikkoman's 'Sesame, Ginger and Soy'. Leave it overnight. Pre-heat the oven at 220C. Place the drumsticks on the roasting tray. Bake it for 50minutes to 60 minutes until a nice caramel colour. Tip: Use the roasting tray with the roasting rack. It'll give a nice crispy colour on both side (not wet and soggy). Turn the drumsticks over after 30 minutes to 'brown' the other side. Line the bottom of the tray with aluminium foil for easy cleaning... otherwise you'll have a tough task to clean the burnt fat off! !